The Maps feature is one of the great things about having an iPhone. With Maps on your iPhone, you can quickly and easily find nearby restaurants and businesses, get turn-by-turn driving directions, and see real-time traffic information. To find a person, place, or thing with Maps, tap the search field at the top of the screen to make the keyboard appear. Now type what you’re looking for. You can search for addresses, zip codes, intersections, towns, landmarks, and businesses by category and by name, or combinations thereof, such as New York, NY 10022, pizza 60645, or Auditorium Shores Austin, TX. If the letters you type match names in your Contacts list, the matching contacts appear in a list below the search field. Tap a name to see a map of that contact’s location. Maps is smart about it, too; it displays only the names of contacts with a street address. 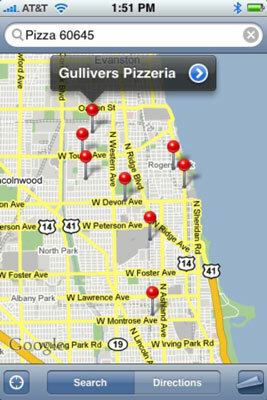 View the pushpins for nearby pizza joints. When you finish typing, tap Search. After a few seconds, a map appears. If you searched for a single location, it is marked with a single pushpin. If you searched for a category (pizza 60645, for example), you see multiple pushpins, one for each matching location.